The problem with writing a short biography of Allen Toussaint is that he did so much that an epistle that would take an hour to read probably still wouldn’t do the man justice. He was born in New Orleans in 1938 and he became synonymous with the music of that city. The artists he wrote for, played on their records or produced reads like a who’s who of the immense cache of talent that emanated from ‘The Big Easy’; Fats Domino, Ernie K. Doe, Irma Thomas, Lee Allen, Aaron Neville, Lee Dorsey, The Showmen…the list goes on. It was Danny Kessler, an A ‘n’ R man who’d run the Okeh label in the early fifties but in 1958 was at RCA that first signed Toussaint as an artist in his own right and it was Kessler who, in 1960 also introduced him to the Seville label soon after it had opened its doors. 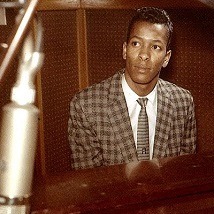 Credited, as he had been at RCA, as Al Tousan, Toussaint released four singles on Seville, the most popular of which was “Naomi”, (November 1960) a tune he named after his mother. The record was released in Britain on the London label, some pressings of which mistakenly named him as Al Pousan. Toussaint was A ‘n’ R head for the Minit label and for the Sansu / Deesu labels which he co-owned with Marshall Seahorn. Later the two would operate the Sea-Saint Studios in New Orleans. Among his other solo albums, his 1970 release on the Scepter label simply titled “Toussaint” and subsequently re-issued as “From A Whisper To A Scream” stands out and remains an excellent example of Toussaint’s style, simple and earthy. It’s an album which still connects the man with the subsequent owners of the Seville label as all the tracks are publishing copyrights of Kassner Music.